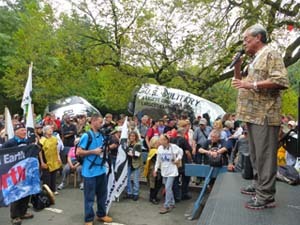 On September 20, 2014, Western States Legal Foundation and partner groups listed above presented a two part workshop at the Climate Convergence Conference in New York City, the day before over 300,000 people marched in the City demanding action to stop global warming. This page has video of both workshop sessions, presentation texts where available, and some additional related videos. Check back for additional presentation texts, which will be added as they are received. 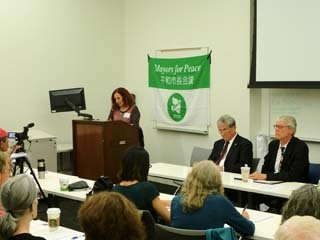 WSLF staff also played a role in organizing a United for Peace and Justice workshop at the Climate Convergence conference, with activists from a variety of UFPJ organizations reflecting on their experience of a decade of peace work in a multi-issue coalition, and what elements of that experience are useful for building the broad movement we need to make progress in slowing global warming. Video of that workshop, facilitated by WSLF executive director Jackie Cabasso, can be found at the link below.